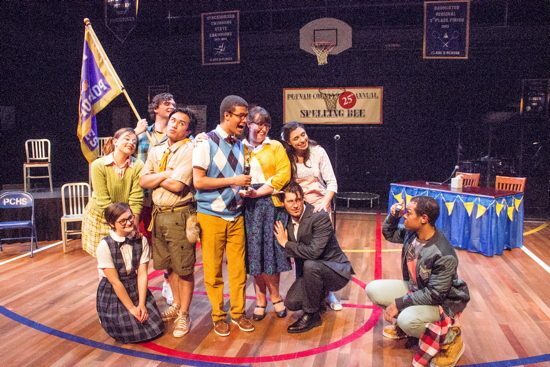 The Way Off Broadway Dinner Theatre in Frederick, MD is currently presenting a hilarious and heartfelt production of The 25th Annual Putnam County Spelling Bee, now playing through June 25, 2016. This musical comedy with book by Rachel Sheinkin and music and lyrics by William Finn, centers around a diversified group of six middle school students all competing to become the Spelling Bee champion. Unique to this play, four real members from the audience are invited up onto the stage to compete in the spelling bee alongside the six young characters. … this ‘Spelling Bee’ gets an “A”! During the spelling bee, the audience gets to know the quirky tweens as they each reveal personal stories from their life. First we meet Chip Tolentino (played by Joseph Waeyaert), a Boy Scout and winner of last years Bee. His parents tell him that “just being here is winning,” although he is still determined to defend his title as reining champion. Proving that he is a brave actor, Waeyaert rises to the occasion as he sings the song “Chip’s Lament,” which is about how he finds puberty hitting at an inopportune moment. Alex Levenson plays with high-energy the role of the youngest competitor, Logainee Schwartzandgrubenierre as a Cindy Brady type, complete with a cute lisp and neatly braided pig tails. Jordan B. Stocksdale is Leaf Coneybear, a slow learning student who is always nervously thinking and acting insecure. The song “I’m Not that Smart” really highlights Stocksdale’s ability to not play for laughs, but rather stick with the integrity of the character, thereby creating natural comedy mixed with heartfelt compassion for Leaf. Complete with glasses, suspenders, and a nasally voice, Thomas Stratton as William Barfee is your quintessential nerd. A Putnam County Spelling Bee finalist last year, William Barfee was eliminated because of an allergic reaction to peanuts. If you attend the show, be sure to look for his famous “Magic Foot” method of spelling. Sporting a grin so wide that it makes the Cheshire Cat look like Grumpy Cat is actress Sarah Burton in her role as Marcy Park, an over-achiever who sleeps only three hours a night, hides in the bathroom cabinet, and is also not allowed to cry. Burton’s body language is so well-executed that one can see by the way she carries herself about the stage that her character is a confident go-getter. Tori Wever does a fine job as the last contestant, Olive Ostrovsky, who is in love with her dictionary and the words that are in them. Will she meet someone that she loves more than a dictionary? The Bee itself is run by three equally quirky grown-ups. Mitch Mahoney is the Official Comfort Counselor who hands out hugs and juice boxes to losing students (Played by a tough, yet compassionate Matthew Lincoln-Bugg). Douglas Panch is the Vice Principal and a judge (Played with good comedic timing by Michael Reid). Rona Lisa Peretti is the number-one realtor in Putnam County, a former Putnam County Spelling Bee Champion herself, and returning moderator (Played by a lovingly stern Marcia Franklin). Director Bill Kiska keeps the action moving at a good pace, while Music Director Jordan B. Stocksdale brings out vocal harmonies that are very pleasing to the ear. This is truly a show that I could see again and again, thanks to the talented cast and creative team. In my opinion, this Spelling Bee gets an “A”! Running Time: Two hours and 5 minutes with an intermission. 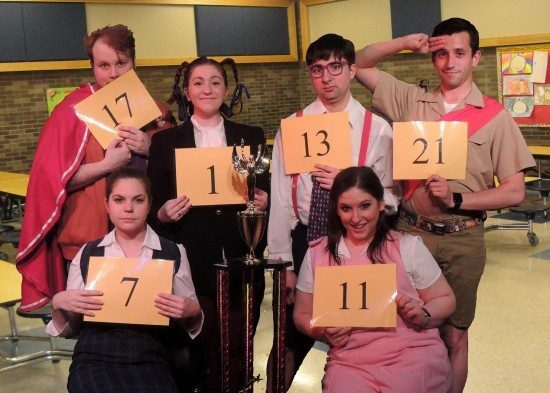 The 25th Annual Putnam County Spelling Bee plays through June 25, 2016 at Way Off Broadway Dinner Theatre & Children’s Theatre – 5 Willowdale Drive, in The Willowtree Plaza, in Frederick, MD. For tickets and reservations, call the box office at (301) 662-6600.